The artisans at Brown Precision, Inc. will once again be building one of their super accurate, long range rifles for the 2014 SCI convention in Las Vegas, Nevada. Included in the SCI silent auction, the proceeds go to further the work of the American Wilderness Leadership School – a professional development program for Educators and Students – near Jackson Wyoming. The Custom High Country Rifle is the flagship of Brown Precision’s line and has been for almost 50 years! This year’s rifle will feature the Remington 700 action, known for its extreme accuracy, and uncompromising strength, in the .300 Winchester Magnum caliber. The .300 Win. Mag. caliber is best known for its superb accuracy and unparalleled energy at extremely long ranges. The action on this rifle will be fully blueprinted to meet the companies exacting standards, and will feature a 26" Ultra Match Grade barrel. To ensure the highest degree of accuracy, the barrel will be cryogenically treated, and will be custom chambered with a custom target crown. The stock will be Brown Precision’s Fiberglass/Kevlar/Carbon Fiber in the classic styling, and will be custom ‘glass bedded with fully free floated barrel. A 1" Pachmayr Decelerator recoil pad will be installed with a 13 ½" length of pull. The finest rifle in the world deserves the finest optics. This is why a SWAROVSKI scope has been chosen to sit atop this rifle. The sharpest image, clearest picture, and highest light transmission will ensure success in every hunting condition. A super durable Teflon metal finish will be applied to all metal surfaces to ensure the harshest environments never keep you from a successful hunt. The rifle will also feature 8×40 Magnum scope mount screws, speedlock firing pin spring and custom scope mounts by Talley Manufacturing. To make sure your custom rifle arrives at your final destination without a scratch, a quality hard case has also been provided. 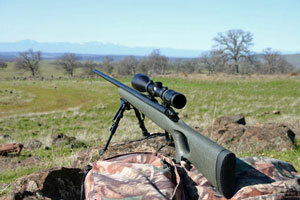 In addition, Safari Arms, Ltd. will be supplying custom ammunition for this rifle. After discussing your specific needs with John LaSala, he will supply a sampling of his super accurate handloads. Once you have determined the best load for your needs, John will be happy to supply additional ammunition for a reasonable fee. Whether hunting Marco Polo in Tajikistan, Ibex in Turkey, elusive Chamois in Spain, or that 200" Whitetail in your back yard, this super accurate, long range Brown Precision Custom High Country Rifle will be just what you have been looking for. This entry was posted in Custom Rifles, Press & Media. Bookmark the permalink.